If you are looking for maximum ventilation without letting in the weather? If so then, awning windows will be a great addition to your home. Awning windows are hinged at the top, and open outward. This sleek and contemporary design allows for an abundance of airflow to enter the room, even when it’s raining outside! The hinge at the top keeps rain and other unwanted debris from entering your home, while still letting in fresh air. Natick Window Company is your area’s leading source for awning window installations, replacements, and repairs! If you are remodeling your home and would like to learn more about adding an awning window to any room of your home, call the expert technicians at Natick Window Company! There are a variety of rooms in your home that would be an ideal space for an awning window. Bathroom Awning Windows – The most common area in which Natick Window Company installs awning windows are bathrooms or powder rooms. These windows allow for the maximum amount of privacy possible while still letting in a great amount of airflow. Installing awning windows higher up in the wall itself will allow for optimal privacy, as well as keeping the window in reach for easy opening and closing. Awning windows are a popular choice for bathrooms so that they can be kept open to allow steam to escape, which will in turn protect your walls and other interior bathroom furnishings from harmful mold and mildew by properly ventilating the space. Sunroom Awning Windows – There is no better choice for your sunroom than an awning window! These windows are stackable to allow the maximum amount of sunlight to flood your sunroom. Rain or shine, these windows will allow airflow and natural light into every corner of your home’s sunroom! Basement Awning Windows – Natick Window Company installs many awning windows in basements for our clients. Since this window is hinged at the top and swings outward from the closure on the bottom, this makes awning windows an ideal choice for basements! If your basement windows are in a hard-to-reach space, consider awning windows for YOUR basement! The generous amount of natural light and fresh air that will enter through these windows will be enough to brighten up any basement space! Keeping the elements out while letting wonderful, fresh air in is a huge benefit to adding awning windows to your home. 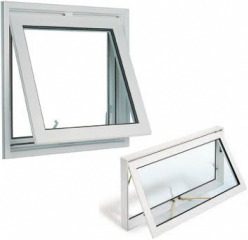 Awning windows are generally designed so that their width is greater than their height, which makes it easier for them to fit in tight spaces.The most common closure for awning windows is a crank handle, which can be conveniently folded into the frame of the window itself or may be flush and lay flat against the surface. No matter what room in your home or adjoining surface, awning windows provide a clean and contemporary look for every home! These windows are usually smaller than other window types, but can be ordered in a variety of sizes. Their unobtrusive design makes them a great fit if you’re looking to blend these with other window styles you already have in your home. Natick Window Company is the area’s leader in awning window services. Contact us today to learn more about how easy it will be to have these great windows in YOUR home by our qualified and licensed professionals! Don’t wait! Call us at 508-251-8038 or fill out our online form to receive a free quote.